And mighty they are. Arches, Bryce Canyon, Canyonlands, Capitol Reef and Zion. California with nine and Alaska with eight have more. But no state can match the grandeur and proximity of Utah's five. Are they alike, or in any way similar? Sure. All are blessed with red rock splendor and myriad scenic vistas. All have pristine beauty and serenity. All have a wealth of backcountry adventures. And all have colorful and welcoming gateway communities providing the necessary lodging, restaurants, guide services, gear/photo shops and support for visitors. But do they differ from one another? Absolutely! To visit one is to miss out on visiting four. Or visiting four is to miss experiencing one, and that one just may just have proven to be your favorite. Here, from southwest to southeast Utah, are "The Mighty Five"
Wind, water and time joined with geological phenomena to create over 2000 (plus or minus) named and cataloged arches. Why plus or minus? An arch that exists today may crumble and no longer exist tomorrow. New arches are constantly forming. This concentration of arches is the greatest density of these formations in the world. What to do. 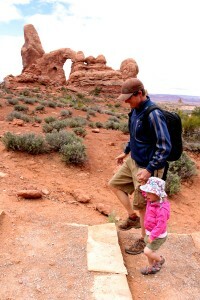 Arches National Park is truly family friendly and a hiker's paradise. Many arches, sandstone fins and monoliths can be seen driving the paved road. But there are many hiking trails from easy to strenuous. And the excitement seen on a child's face walking beneath a massive arch is a lasting experience. One such is Landscape Arch. From base to base, a football field, 306 feet! But there are so many to be discovered one tends to lose count. Kids will enjoy The Junior Ranger Program and interpretive talks and walks. Other hikes provide access to outstanding viewpoints and many of the park's famous features, including Balanced Rock and Delicate Arch. In many cases, trails travel under arches, presenting quite a different and dramatic perspective than what is visible from your car. Courthouse Wash trail is a short walk and a brief climb that rewards with a prehistoric rock art panel. The half-mile hike to Double Arch on a relatively flat, sandy trail leads to the base of two giant arch spans which are joined at one end. 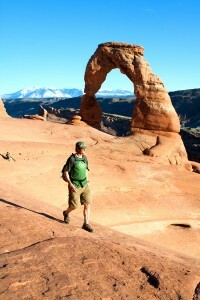 The hike to Landscape Arch is also easy and takes less than an hour round trip. Slightly more advanced routes may take the hiker up to three hours round trip. Tower Arch trail, about 3.5 miles, climbs a steep, but short, rock wall, cuts across a valley and then meanders through sandstone fins and sand dunes. Arches is not lacking for trails for seasoned, advanced hikers. A good one is Devils Garden Primitive Loop. At over seven miles and up to 5 hours of hiking this is the longest of the maintained trails in the park. But the time and distance is well worth the effort. Devils Garden Trail leads to eight awe-inspiring arches. 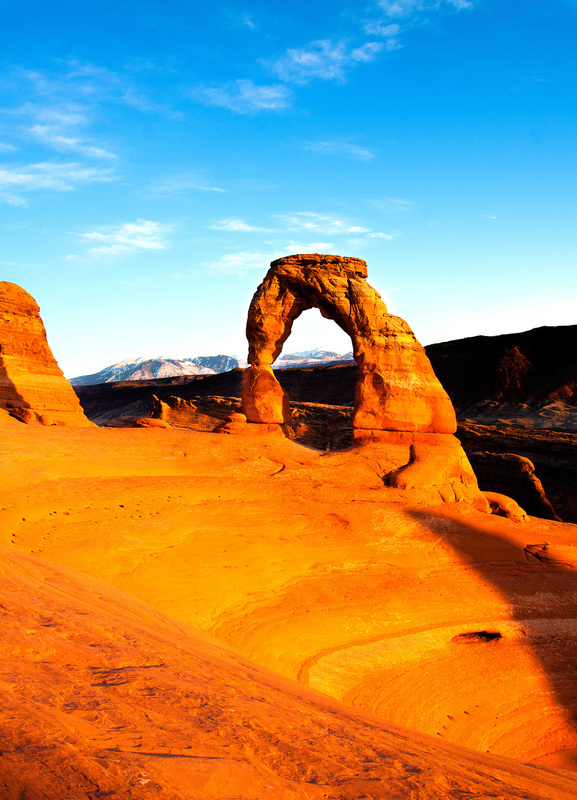 But the one must do hike in Arches National Park is a visit to the iconic Delicate Arch, so synonymous with Utah that it is featured on the state's license plates. To get to Delicate, one must conquer the elevation change - 480 feet with no shade along the route. The climb traverses over open slickrock with some exposure to heights. Just before you get to Delicate Arch, the trail goes along a rock ledge for about 200 yards. This is no walk in the park. 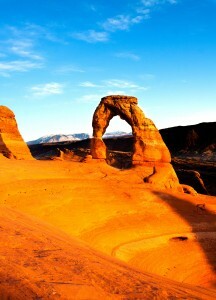 However, there is another short easy route of about on half mile to reach a viewpoint of Delicate Arch. The Backcountry. Much of Arches National Park can be accessed by intermediate hikers. The Fiery Furnace, however, is the exception. This relatively small part of the park is an amazing labyrinth of narrow passageways and abrupt dead-ends among a series of sandstone fins. There is no marked trail in the Fiery Furnace and within its twists and turns it is easy to become disoriented or lost. In addition, basic canyoneering skills are necessary since one will need to scramble up and through narrow cracks and along steep ledges above drop offs. 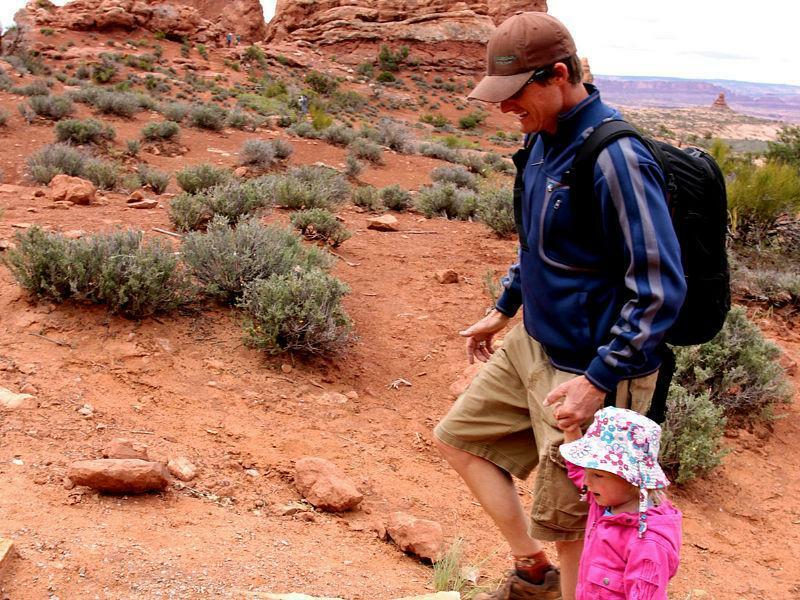 For this reason, and to protect native plants and soils, visitors must either join a guided hike with a park ranger, or obtain a special permit to enter the Fiery Furnace. If you choose the latter, go with somebody who has knowledge of the area. The three-hour Ranger guided hikes into the Fiery Furnace are offered daily, spring through fall.